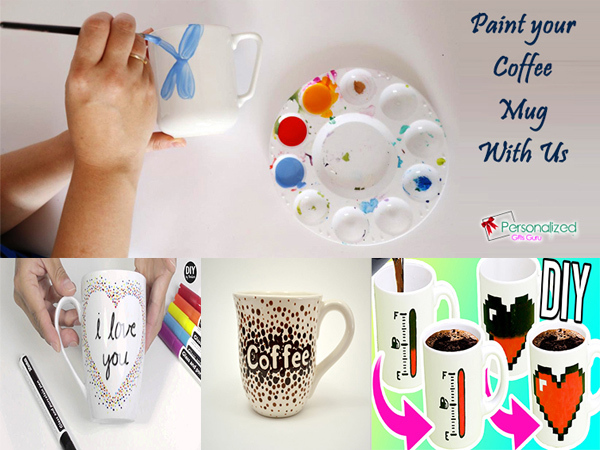 Been very occupied these days but today, I am going to share with you a guest post about how to paint your coffee mug. Enjoy! The more you indulge, the more you can be creative with your mind. There are unlimited DIY tutorials help you in making home décor things. In some check this post so you can make the gifts at home following simple utensils of home. Personalized coffee mug gift is in fashion now. People do buy printed or personalized coffee mug to give the special gift to one very close to heart. Considering this we have come with the best guidelines for making beautifully printed mug from home only. It’s very easy to make. It fits into your budget and also a good thought for giving a unique gift for the extraordinary people. If you are planning to buy the gift for your friend or family Personalized gift delivery shop is the best way to find supreme gifts on a budget. Make the coffee drinking time a quality time with ombre dots coffee mug. Imagine when you sip your coffee in the styled coffee mug. 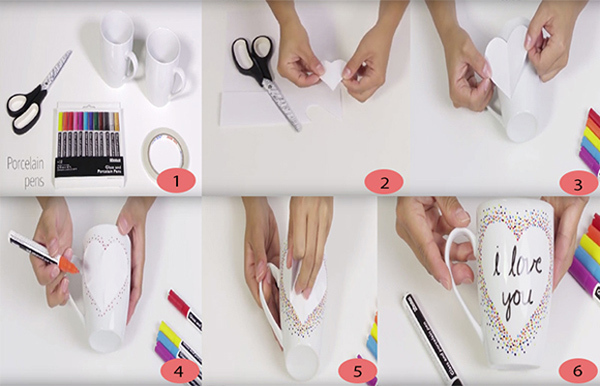 Making ombre dot coffee mug at home is easy and simple. You will need small things to apply and use. Look at the complete tutorial, how to make this. For this you will require dot maker, Mug bisque, stickers, toothpick, paint pod colors, you can choose the light brown (67), Brown (71), dark brown (72) color. Let’s get started by sticking the “coffee” words in the middle of the mug. Stickers are the easiest ways to get the best designs and paints on the mug. But buy the quality stickers don’t remove easily from the mug. Press the stickers properly. Now time is to make the small dots around the stickers. Start making dots of dark brown with dot maker. Don’t worry about the size just put dots of random size. To get the lighter side now finish the half of the sides with light brown dots. It will create an ombre design from dark to the light side. Once you finish it put it aside for drying. If you want the immediate results you can put this into the oven for 1 or 2 minutes. Now with the help of toothpick remove the stickers. Your ombre dot coffee mug is ready for gift giving or enjoying a home décor. Painting with porcelain pens is so popular in making a coffee mug, flower vase; interesting photo frames and. Here we are going to use the porcelain pens make the different types of designs with a pen. This is going to be a very easy task for you to make a gift on your own. Now let’s start making it. We will start by making an "I love you" Porcelain mug. First, the wash the mug in porcelain water and dry it by cotton cloth. Now take one white paper and cut a heart shape with a scissor. Now stick the double side tape on the heart shape and stick it on the porcelain mug. Now the time is to make dots around that heart with porcelain pens. First, shake the pen and press out the color. Use red color pen and start making dots around the heart, now apply different color pen dots like yellow, light green, orange. Now remove the heart shape paper easily. In that empty space write, I love you with black or red color porcelain pen. Following the same procedure, you can apply bunny face or any message on this porcelain mug. You will need porcelain paint, porcelain color, sensitive pigment easily available on eBay and ceramic varnish. 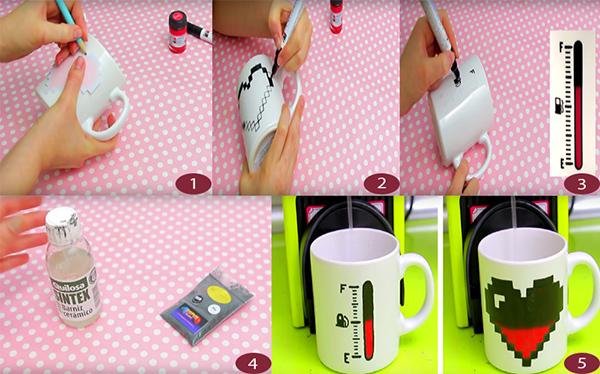 First, start making the design of heart shape on mug using porcelain pens. You can cut the heart shape and stick it on the mug for the perfect outlook. Now use a black color pen to paint the border of the design. Now fill this heart with red color porcelain paint. Get sensitive pigment and mix it in ceramic varnish liquid. Make the liquid like in ink-like consistency. Now start painting the red surface with this sensitive pigment liquid. Let it dry for 10 hours. Afterward, pour the hot water inside the mug, magical red color from black color will appear as the heat enters in the mug. It remains only for few seconds, after some seconds it will come back in the same black color design. You can also make other designs following the same tutorial. If you are planning to go for a wedding party, birthday party or in any happiest occasion personalized gift for her is the best option to choose for. Here we have guided you a complete tutorial about how to make the personalized mug on your own. It is simple and easy to make a gift at home. Hope you will like it and try to make it at home. I've always wanted to learn how to create DIY mug design for a more personalized feel. This is something I want to try soon but I'm still thinking of a good design to do. Also, its great that tou gave tips on what tools to use for it. Thanks! Painting something is a struggle especially if you are a leftie. The struggle is so real! This is a great idea as a gift for someone special. Though, where did you buy the mug?